A fantastic early dessert apple Discovery is beautiful with smooth, red skin. Juicy, crisp, pink, sweet flesh makes this a popular choice. 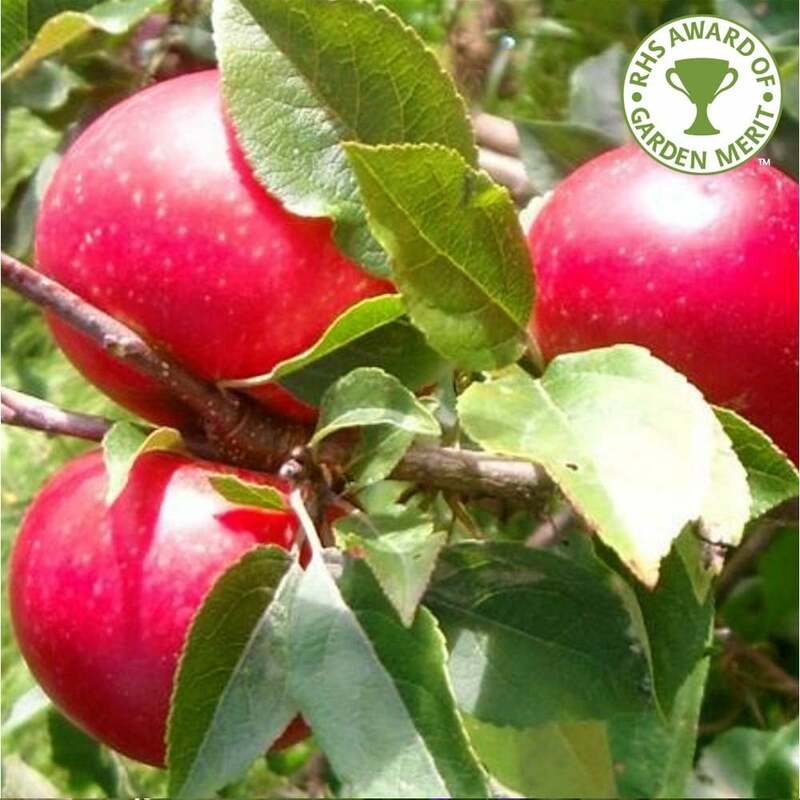 The flavour of Apple Discovery is often likened to strawberries so it makes the ideal sweet apple for children. The Apple Discovery is tough and suited to Northern or more difficult areas. Crops of juicy red apples ripen in August and should be eaten straight from the tree. Apple Discovery is from Essex in 1949. As a group B apple, any apple in group A, B or C will act as a good pollination partner when located within a half mile radius. In addition to the traditional tree form, we offer Discovery apple trees as a pillar cordon on a dwarf rootstock that is perfect for keeping in patio pots. Discovery is a group B apple tree and requires a suitable pollinator within a half mile radius. Apple trees should be spaced according to their rootstock, for example an MM106 (semi-vigorous) rootstock will require approx. 4.5 metres between trees, whereas an M27 (very dwarf) rootstock will require approx. 1.5 metres between trees. Our pot grown Discovery apple trees can be planted at any time of the year but bare root ones need to be planted between November and March. Remove weeds and grass within a metre of your desired planting hole then dig a hole slightly deeper than your root mass and approximately 3x as wide. To help your tree establish more effectively, apply root grow. Gently loosen the roots and place into the planting hole. Using 50% of the original soil and 50% compost, fill in the hole and firm around gently. Make sure not to bank the soil up around the collar of the tree. We recommend planting fruit trees using a stake and tie and a rabbit guard.